Update (02/20): Google Pay has arrived! The new branding has started rolling out today as part of an update to the existing Android Pay app. At the time of writing the Play Store link shared by Google still redirects back to the vanilla Android Pay app, so you may have to wait a little longer to see the new name and logo on your phone. While it’s great to see the widely-celebrated merger of Android Pay and Google Wallet make its debut, it isn’t quite the finished article just yet. Most notably, the latter app’s main functionality – peer-to-peer payments – is nowhere to be seen. According to Google, users in the US and UK will be able to send and request money “within the next few months”. 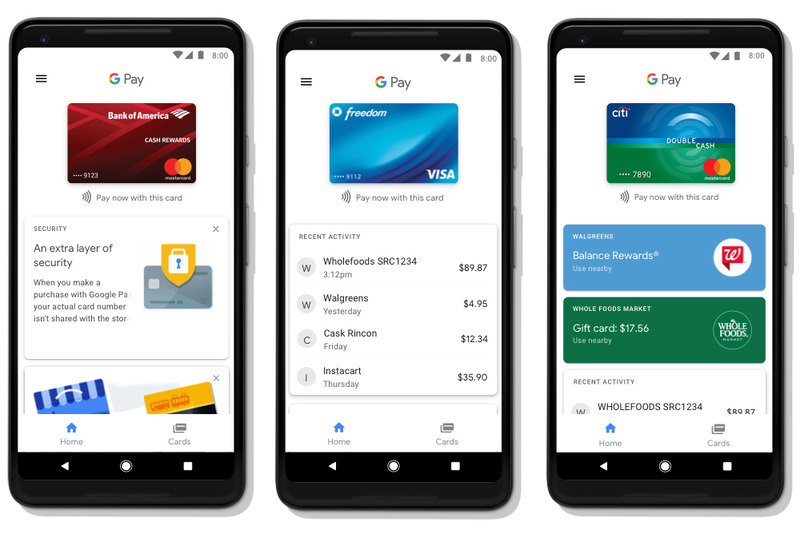 To make up for the lack of P2P payments, Google has rebranded Wallet as Google Pay Send and overhauled the UI. It isn’t clear whether or not Pay Send will stick around after the Pay app is fully fleshed out, but I really hope not – after all, wasn’t the goal here to bring all of the features under one brand in a single app? The newly-monikered Pay app will also enjoy a new look with a neat white background and curved information cards (think Pixel launcher-style). The Home tab displays recent purchases, lets you find nearby stores, shows rewards, and provides tips, while a new Cards area stores any registered credit or debit cards, loyalty scheme details, gift cards, and more. You can see the new design in the image below. Original story (01/08): The times they are a-changin’ for Google’s payment systems. The company has announced the merger of Android Pay and Google Wallet into a single brand, Google Pay. Google Wallet was first launched in 2011, and at one time supported NFC payments for goods and services. In 2015, the company launched a new service, Android Pay, for online and real-world payments, and Google Wallet became a person-to-person payment system. It appears Google wants to avoid confusion by making this branding change. At the moment, it looks like people who use Android Pay and Google Wallet won’t see much change other than the new Google Pay name and logo. In fact, the Google Pay branding is already available on websites and apps from Airbnb, Dice, Fandango, HungryHouse, and other businesses. Tez users in India will also see Google Pay features in the near future as well. The company’s blog post hints the rebranding is just the first step, and that more news on its payment system will be revealed in the near future, most likely as part of its 2018 I/O developer conference. In the meantime, what do you think about the company mashing up Android Pay and Google Wallet into Google Pay? Let us know your thoughts in the comments.